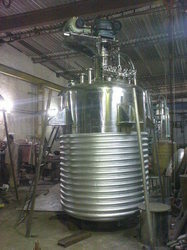 We offer rich range of Industrial Chemical Reactor to our clients. Industrial Chemical Reactors are used by our clients widely and appreciated for their unique features. These Industrial Chemical Reactors are easy to operate and take very less maintenance cost. These jacketed chemical reactors are easily available from the market at cost effective prices to our clients. Industrial Chemical Reactor are tested well before dispatch and are made from excellent quality material and advanced technology. Looking for Equipment Fabrication ?